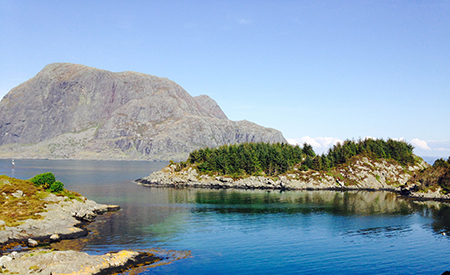 Værlandet and Bulandet is an archipelago off the Norwegian west coast, and has for centuries been important to those travelling the coast. Today this is the most western fishing village in Norway with an all year community. What visitors may find spectacular, is in fact our everyday life. The headland Streten before the construction of Værlandet Havhotell started. The mighty cliff rock Alden is in the back. The last decades it has become more popular to visit smaller communities, like Værlandet and Bulandet, and the demand for accommodation has therefore increased. The idea about building an oceanfront hotel came in the spring of 2011, and the headland «Streten» was soon chosen as the best location. After thorough research, the planning of the project started, and the project plan was finalized and financed in 2014. The build started in January 2015, and about one year later the hotel is finished. This is an example of what is possible when local entrepreneurs meets sturdy partners and new ideas.